When setting up an exhibition booth at a high-class venue such as a four- or five-starred hotel, an exclusive convention centre, or a high-end shopping mall, it’s more than likely that you’ll need more than one accessory for your display. If you buy your trade show displays piece by piece, you can rack up your costs quite easily. This won’t be good if your budget is tight. It doesn’t mean that you have to cut corners just to save on costs, though. Why don’t you try our package deal for trade show displays? Double-sided printing option is available. What advantages can you expect to get when you avail of this package deal? First, you are sure to have attractive trade show displays. Our pop-up walls and banners all have a professional appearance. The graphic panels, the fabric graphics and the graphic wraps used in these displays are all produced using the latest in fabric printing technologies, which always results in colours so alive and details so rich. The images on these graphics are so clear they can even be seen from afar. Second, these displays are stable and durable. The pop-up wall and the pull-up banner stands all have aluminium frames made of tightly interlocking poles to support them. They will not easily topple over from sudden movements or gusts of wind. The public can confidently remain safe around your displays. Third, these trade show displays are practical. They have their own carry cases, so you can transport them from place to place without much of a fuss. They set up easily – it only takes less than ten minutes to assemble each piece in this package. Easy setup means you don’t have to exert a lot of effort in putting together your display, and you get to save time and manpower as well. And you can readily customise the look of your display by adding to or subtracting from your accessories, depending on the amount of space you’re allotted for your exhibition booth. Last, but certainly not the least, is you get to save more money with this package. As stated earlier, our package deals already help you reduce on costs on displays that are already affordable on their own. But not only that, you get to reuse these displays as often as you want to, as well as take them to any venue you need them at. In case you need new graphics for your displays, you don’t have to buy a new set at all. Simply order new graphics to replace the older ones and you’re good to go. As said earlier, it takes less than ten minutes to set up each item in this package. Here are instructions on how to assemble these items. To put up the pop-up wall, you only need to pull at the aluminium frame until it stretches to its full size. Once that is done, you attach the laminated graphics to the frame using the magnetic strips fastened onto the frame and the graphic itself. If you’re using the optional halogen spotlights, you just attach them to the top of the frame. To assemble the pull-up banner stands, the first thing you have to do is to lock together the support pole of the banner stand and insert it in the slot provided on the stand’s base. Then you pull up the banner from the base and hook the top of the banner to the top of the support pole. Just put up the optional halogen spotlights on the top of the support pole if you’re using them. Putting together the display counter involves pulling the graphic wrap over the body of the pop-up wall’s carry case. Then you just place the wooden countertop right on the case. 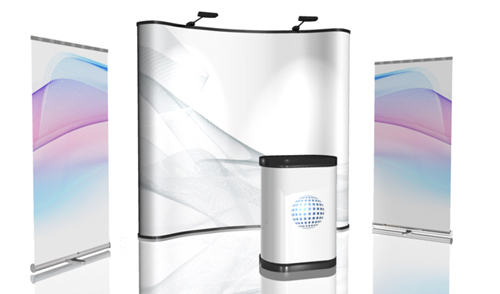 This package deal is guaranteed to save you time, money and effort on your trade show displays. It is a smart investment that you truly must consider if you intend to become a regular at expos and trade shows. We deliver to any location in Australia, including Sydney, Melbourne, Perth, Adelaide, Brisbane, Gold Coast, Canberra and Darwin. Call us right now for more information on this package.